Games form a major part of our present. Currently dominated by computer games, their audiovisual language along with the interaction processes associated with them have crept their way into our everyday lives in ways we are not even aware of. Yet, these games would be rendered irrelevant without space, or a context in which, on which or at which they are based. This game space extends from the act of “playing”. “Play” exists in every species that has the capability to learn. Play is one of the ways in which animals teach their young one’s survival skills – kittens hide and pounce, key for catching prey. Animals that live in social groups possess this ability to learn through play, which in turn results in the beginnings of culture, that is, transmission of knowledge within a group (Costikyan, 2013). Humans create culture, that’s what makes us different from other animals. By nature, we complexify and elaborate everything we do by an extreme degree. We have created culture out of simple acts such as eating. We don’t eat food solely as a source of fuel to stay alive, we have created rituals, techniques and places for eating. Similarly, we have created Games from the simple act of play. Games tell stories and influence the player in multiple ways, similar to the ideas of Interactive Architecture, where the engagement of the human with the design is of utmost importance, alongside creating memorable experiences. Games vary from trivial games made on paper (Tic Tac Toe), to more complex board games (Monopoly, Settlers of Catan etc.) and computer games and more recently ‘Pervasive Games”. Pervasive Games are a new breed of games that extend into the real world. Environments range from city streets, to the countryside, wilderness and even our homes. Location tracking, sensors capture information of the surrounding environments (context) and the game responds to all this data along with data from the player himself – his mood, actions etc. A few examples of such games include – “Urban Free Flow” by David Belle and Sebastian Foucan, where the individual is an active performer and strive to overcome obstacles in the urban environment. “Chromaroma” by Mudlark allows Londoners to play a real life game while travelling around London using their oyster cards. Their project can be viewed here. Game designers constantly work with architects, study architecture, and learn from architecture, to create meaningful and powerful experiences for players. Games tell stories and influence the player in multiple ways, similar to the ideas of Interactive Architecture, where the engagement of the human with the design is of utmost importance, alongside creating memorable experiences. What makes people play games? “Uncertainty” is a part of our daily life. Uncertainty about weather, health, job prospects or even affections of people who matter to us. Much energy is devoted to managing this uncertainty. This uncertainty, however, cannot be governed by ones individual choice or will. We must rely on circumstances and other people for situations to work in our favor. To be able to face uncertainty in a scenario which does not affect our daily lives, or better yet to take control of situations with our own will we have created games. Games are fictional and non-threatening and are a cultural response to uncertainty of daily life. Uncertainty in games does not necessarily mean uncertainty in the outcome of a game (win or lose), but may also be in the path that the game follows, the way the players manage problems or surprises the game may hold. Take for example, the simple game of Tic Tac Toe. As a child the game was extremely appealing to us, but as we grew older we began to realize that the outcome of the game is not as uncertain as we once thought it was. We learned quickly that the first player to play will take the central square, because it is advantageous, and unless the players are naïve or intend to lose, they will prevent each other from getting three in a row. It is a solved, trivial game and no one beyond a certain ages can play it with enjoyment, because after years of playing the same paths no uncertainty remains and the games becomes extremely predictable. Yet the game exists, is taught, is played by children and enjoyed. To them the outcome seems uncertain, for they have not yet figured out that the game has an optimal strategy. Once the game space is reduced, choice is restricted as well. Most games open up the games space to certain degrees, apparently creating increasing choice, which in turn keeps people intrigued. Changing levels of difficulty is another factor which contributes to keep people playing. In games like Backgammon, Checkers and Chess, gradually, obstacles are eliminated and the playing field (game space) gradually opens up. These changing spaces require the players to reconsider their initial strategies, maintaining their interest. Video games later adopted this technique and opened up levels to increase difficulty (Costikyan, 2013). As stated before, game design is very useful in developing a user’s experience in a space and has much to tell architects about the ways that these experiences can be crafted. With that, this project proposes a new design process for architecture that pushes architectural design through the “filter” of game design to create a hybrid design process. As stated before, game design is very useful in developing a user’s experience in a space and has much to tell architects about the ways that these experiences can be crafted. 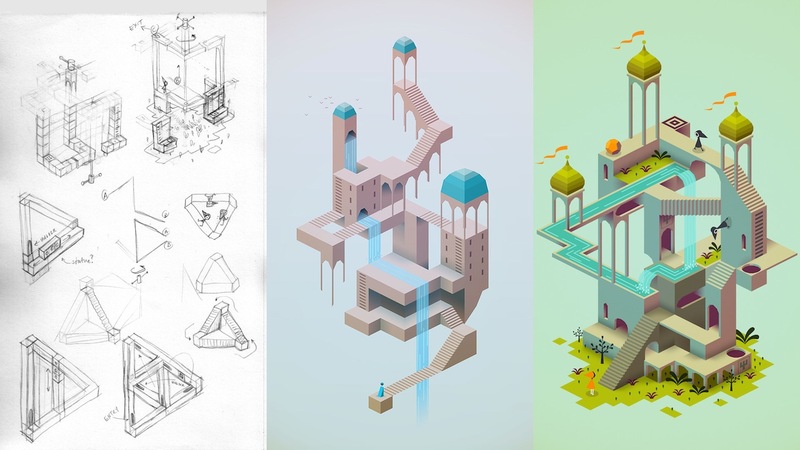 Monument Valley is recent game designed by London-based digital design firm “ustwo”. The first thing most people notice about Monument Valley is its striking and bold visual design. And that was the first thing Ken Wong, the game’s lead designer and lead artist, came up with. Wong wanted a project where he could “make architecture the main character,” but that vague concept only truly took shape when by chance he encountered some classic M.C. 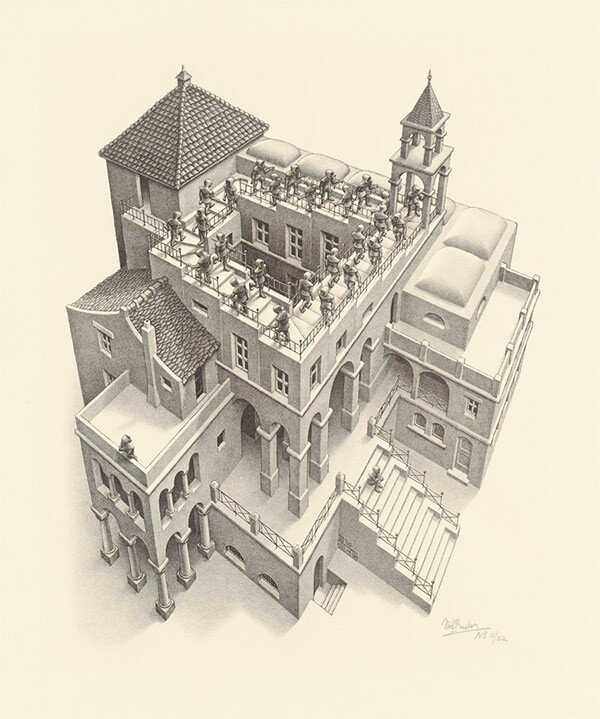 Escher art. In Rodney A. Brooks Elephants Don’t Play Chess, he talks about how modules in a system in classical AI, generate a collective behaviour of the system as one. To make this system intelligent, it is necessary to ground it in the physical world. This is done with sensors and actuators, making it a completely bottom up approach to designing robotics. By doing so the modules will extract all their knowledge from their environment through these physical sensors. “Careful design of the simple behaviours and their interactions can often produce systems with useful and interesting emergent properties” (Brooks, 1990). But what is to come from these systems for the people who interact with them, without the element of delight or wonder or amazement or in the case of games uncertainty? Stephen A. Gage believes architecture and building are different from each other, since the former is created “to induce sensations of wonder and delight in its observer” (Gage, 2006). Trivial machines (architecture) can create these sensations during the process of construction or when a passerby experiences it for the first time, but how does the architect maintain this engagement and sense of wonder in the passer by? A non- trivial machine is a trivial machine with another unknown machine within it (hidden inner state), which can modify the outputs and make them unpredictable. But, if the construct would be placed in an environment which is highly unpredictable, we can simple reverse the placement of the machines, where the non-trivial machine actually transforms into a trivial machine with a trivial machine within it, echoing a system formed with simple modules which react to their environment to create intelligent, complex networks and systems. A discussion on Game AI is explored by understanding the Game AI for Pac-Man in my previous post here. Benford, S., MagerKurth, C., & Ljungstrand, P. (2007). Pervasive Games. In F. v. Borries, S. P. Walz, & M. Bottger, Space Time Play (pp. 244-250). Brooks, R. A. (1990). Elephants Don’t Play Chess. Robotics and autonomous systems , 6 (1), 3-15. Costikyan, G. (2013). Uncertainty in Games. The MIT Press. Gage, S. A. (2006). The Wonder of Trivial Machines. Systems Research and Behavioral Science , 23 (6), 771-778. Glanville, R. (2001). An intelligent architecture. Convergence: The International Journal of Research into New Media Technologies , 7 (2), 12-24. Jenkins, H. (2004). Game design as Narrative Architecture. Computer , 44 (3). Juul, J. (2007). Variation Over Time. In F. v. Borries, S. P. Walz, & M. Bottger, Space Time Play (pp. 100-103). Koven, B. D. (2013). The Well-Played Game: A Player’s Philosophy. MIT Press. Mateas, M. (2003). 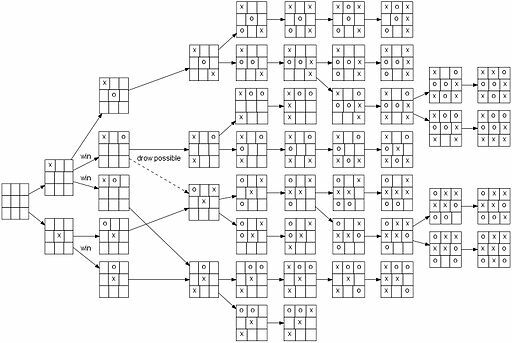 Expressive AI: Games and Artificial Intelligence. In in Proceedings of International DiGRA Conference. McElhinney, S. (2009). Labyrinths, Mazes and the Spaces Inbetween. European Meeting of Cybernetics and Systems Research . Millington, I. (2006). Artificial Intelligence for Games. San Francisco, CA, USA: Morgan Kaufmann Publishers Inc.
Schmidt, F. (2007). Use Your Illusion. In F. v. Borries, S. P. Walz, & M. Bottger, Space Time Play (pp. 146-149). Birkhauser. Sharkey, N., & Sharkey, A. (2006). Artificial intelligence and Natural Magic. Artificial Intelligence Review , 9-19. Sicart, M. (2014). Play Matters. The MIT Press.